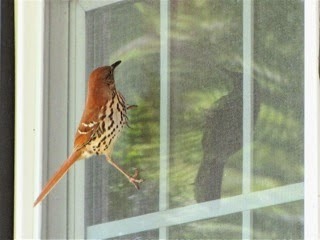 We have Brown Thrashers nesting in the bushes next to our screened porch. We saw them gathering nesting materials from the ground and flying up into the bush. These bushes are very dense so there is no way to see the nest and we don't get near any nests so the parents are comfortable with their choice of location. They typically nest in dense shrubs, especially those with thorns. Some of the shrubs used are gooseberries, native honeysuckle, eastern red cedars, honey locust trees, rose bushes, and small elms trees. In the front of the house we have a dense area of hollies that usually host a nest or two each year. This year we have seen the Brown Thrasher fly out of there ... and yet we've also seen the Gray Catbird defending that territory against a Blue Jay. Was he helping the Brown Thrasher or does he have a nest in there also? I've seen both of them chasing off a Blue Jay and was rather excited with the thought that they were being such great neighbors to each other. Besides our honoring their privacy, Brown Thrashers are aggressive defenders of their nest, but are especially likely to abandon nests, lose eggs, or baby chicks if people spend time in the vicinity of the nests, so we will give them that space until they are finished raising their young. Predators include raccoons, dogs, snakes, people and even cowbirds which is a bird that lays its eggs in other birds' nests. With their long sharp bills they strike hard enough to draw blood. They are the largest common host of Brown-headed Cowbirds. These birds parasitize a nest by laying their eggs, one at a time, in other birds' nests. The Thrashers do resist, often rejecting the eggs that are laid in their nest. We haven't had Cowbirds on a regular basis, but it is interesting that I have seen one this year when it seems the Brown Thrashers are nesting in several places. 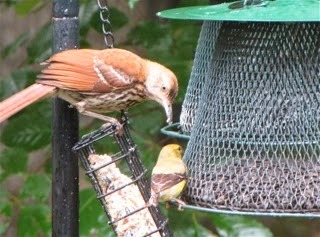 Our Brown Thrasher residency has been growing each year. Brown Thrashers "thrash" about in the leaf litter swinging from side to side in search of insects. 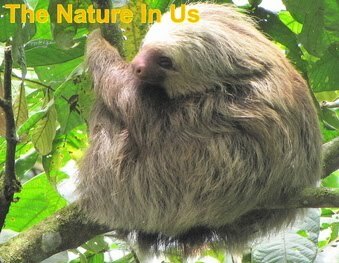 In our eastern side of North America, we find them in hedgerows, thickets and overgrown areas of deciduous forests. They will also eat nuts, berries and seeds. We have seen them on the suet feeder also. Since they spend most of their time on the ground or in low bushes, they are quite susceptible to house cat kills. 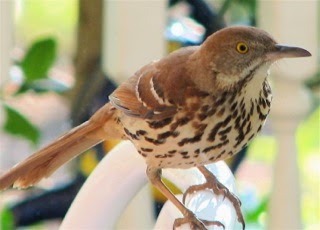 Brown Thrashers are very accomplished songsters (being of the same family as the Gray Catbird and Northern Mockingbird). They may sing more than 1100 different songs and imitations of other birds. It's the opinion of many ornithologists that their song is richer and more melodious than that of the Northern Mockingbird. You'll have to watch for this bird in the tangled masses of shrubbery, but once you get to see them, you will be hooked. They are so gorgeous with the heavy, dark streaking on their whitish breast. They tend to have a severe expression on their face due to their heavy, down-curved bill and staring yellow eyes. I delight in the fact that they often stand with their tail cocked upward like a wren, which is one of my favorite birds. Although Brown Thrashers are usually secretive type birds, ours seem to have a bit more trust of us from years spent returning here to nest. It seems our dining room window which is on the front porch has the right reflection for the male to compete with his own image. One year a male Thrasher spent an hour on the table out there giving strange looks and singing and fussing away. As you can see from the pictures, we see them more than just hidden in the brush.